Complete your kid’s room with DHP’s Full-Over-Full Metal Bunk Bed. With square posts and simple design, this bunk bed will complement any room décor. The bunk bed includes metal slats for support and durability, and can be used without a box spring or bunkie board. It also includes full length guardrails for upper bunk and a sturdy integrated ladder for safety. 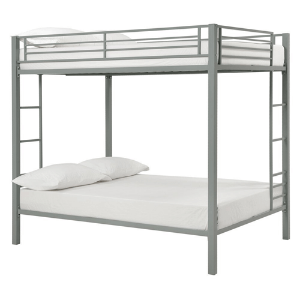 Functional and space-saving, this Full-Over-Full Metal Bunk Bed is perfect for kids sharing a room or for sleepovers. Weight limit for the upper bunk is 450 lbs. Weight limit for the lower bunk is 600 lbs.